ARCHIVE-THANKSGIVING RECIPES 2013 | COFFEEBREAKWITHFRIENDS! “I wasn’t always a briner,” says Shawn McClain, “but when enough people tell you it’s the thing to do, you try it.” He’s glad he did: The brine here, which is a simple combination of salt, sugar, spices and water, keeps the turkey moist in the oven and seasons the meat perfectly. In a large saucepan, combine the fennel, mustard and coriander seeds with the bay leaves, salt, sugar and 1 quart of the water. Bring to a boil, stirring to dissolve the salt and sugar. Transfer the mixture to a very large bowl or pot and add the remaining 7 quarts of cold water. Add the turkey, breast side down. Cover and refrigerate for at least 8 hours or overnight. Preheat the oven to 450°. Drain and rinse the turkey and pat dry; discard the brine. Starting at the neck end of the bird, slip your hand between the skin and meat to loosen the turkey skin. 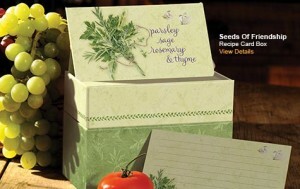 In a medium bowl, combine the 2 sticks of butter with the parsley, sage and thyme and season with pepper. Spoon 1/4 cup of the herb butter into a small bowl and stir in the flour; cover and chill. Spread the remaining herb butter all over and under the skin of the turkey and set it on a rack in a roasting pan. Add 2 cups of the stock to the pan and roast for 30 minutes. Lower the oven temperature to 325° and roast the turkey for about 2 1/2 hours longer, basting occasionally; the turkey is done when an instant-read thermometer inserted in the thigh registers 170°. Transfer the turkey to a cutting board and let rest for 30 minutes. Meanwhile, in a large saucepan, melt the remaining 2 tablespoons of butter. Add the onion, carrot and celery and cook over moderate heat, stirring occasionally, until softened, about 5 minutes. Stir in the bread and cook for 1 minute. Add 2 quarts of the stock and bring to a boil. Simmer over moderate heat until the liquid is reduced to 3 cups, about 1 hour and 15 minutes. Whisk to break up the bread. Strain the stock through a fine sieve and return it to the saucepan. Whisk in the chilled reserved herb butter and bring the gravy to a boil. Cook, whisking, until thickened, about 5 minutes. Pour off the fat from the roasting pan and place the pan over high heat. Add the remaining 2 cups of chicken stock and cook, scraping up any browned bits stuck to the pan, until boiling. Strain the pan drippings into the gravy and season with salt and pepper. Carve the turkey and serve on a platter, passing the gravy at the table. Pinot Noir’s balance of crisp fruit, light spiciness and moderate tannins makes it very versatile—ideal with all the big flavors in this Thanksgiving menu from Shawn McClain. In a small bowl, combine the kosher salt with the sage, black pepper, paprika and sugar. Set the turkey in a large roasting pan and rub it with the spice mixture inside and out; refrigerate for at least 12 hours or for up to 24 hours. Return the turkey to room temperature before roasting. Preheat the oven to 475°. Stuff the turkey body cavity and the skin flap at the top of the breast with the Rye Bread Stuffing with Sausage, Apples and Bacon, packing it loosely. 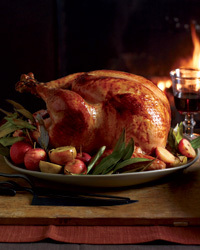 Brush the turkey all over with the melted butter and roast for about 30 minutes, or until the skin is golden brown. Scatter the onions, celery and carrots around the turkey, add the water to the pan and cover the breast loosely with foil. Lower the oven temperature to 325° and roast the turkey for about 3 1/2 hours longer, or until an instant-read thermometer inserted in the thickest part of a thigh registers 165°; remove the foil for the last 15 minutes of roasting. Transfer the turkey to a carving board, cover loosely with foil and let rest for at least 30 minutes. Pour the pan juices into a medium saucepan and skim the fat from the surface. Set the roasting pan over 2 burners and cook the vegetables over moderately high heat, stirring frequently, until golden, about 5 minutes. Add the remaining 4 tablespoons of butter and the flour and cook, stirring frequently, until the vegetables are coated with the flour mixture and lightly browned, about 2 minutes. Stir in half of the Rich Turkey Stock and cook, scraping up any browned bits from the bottom of the pan, until the gravy is slightly thickened. Strain the gravy into the pan juices in the saucepan, pressing on the vegetables; discard the vegetables. Add the remaining turkey stock to the gravy and cook over moderate heat until thickened and reduced to 4 cups, about 25 minutes. Season with salt and pepper and transfer to a large gravy boat. Carve the turkey, arrange on a platter and serve with the stuffing and gravy. Preheat the oven to 350°. 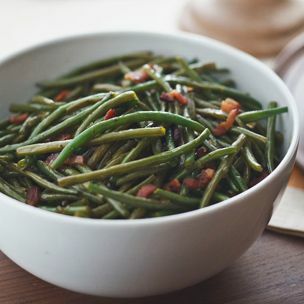 In a small bowl, blend the butter with the soy sauce, 1/4 cup of the minced shallots, 2 tablespoons of the chopped thyme, 1/2 teaspoon salt and 1/4 teaspoon pepper. Separate the skin from the turkey breast and rub 2/3 of the shallot butter over the meat, then smooth out the breast skin. Rub the outside of the turkey with the remaining shallot butter and season liberally inside and out with salt and pepper. Tuck 5 of the thyme sprigs into the cavity. Pour the wine and 1/2 cup of the chicken stock into a roasting pan fitted with a V-shaped rack. Set the turkey on the rack and roast for 30 minutes. Baste with the pan juices. Roast the turkey for about 1 hour and 45 minutes longer, basting every 30 minutes and adding chicken stock to the pan as necessary; keep the pan moist throughout roasting so the drippings don’t burn. If the turkey starts getting too dark, tent it loosely with foil. The turkey is done when an instant-read thermometer inserted in the inner thigh registers 165°. Transfer the turkey to a carving board and let rest for 20 to 30 minutes. Meanwhile, in a medium saucepan, cover the turkey neck, heart and gizzard with the 3 cups of water. Add the remaining 3 thyme sprigs, season with salt and pepper and simmer for 20 minutes. Strain the turkey broth and reduce it to 2 1/4 cups. Pour the pan drippings into a fat separator; reserve 2 tablespoons of the fat and all the drippings. Add 1 1/4 cups of the turkey broth and the Madeira to the roasting pan; simmer, stirring to dissolve the browned bits; you should have 1 1/4 cups of jus. In a medium saucepan, heat the reserved turkey fat. Add the remaining 1/4 cup of shallots and cook over moderately high heat, stirring, until softened. Add the remaining 1 tablespoon of chopped thyme and cook for 1 minute longer. Stir in the jus, pan drippings and the remaining 1 cup of turkey broth and bring to a simmer. Stir in the cornstarch slurry and bring to a boil to thicken very lightly, then season with salt and pepper. Transfer to a gravy boat. Carve the turkey and serve with the gravy. In this turkey recipe, chef Jose Garces prepares the bird in the same style as a traditional Yucatán dish called cochinita pibil, a slow-roasted pork marinated in citrus and annatto paste (made from achiote seeds, the condiment adds an orange hue to foods). Brining and marinating the bird make it especially succulent. 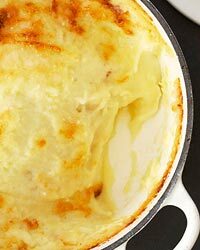 NOTES To roast garlic, place 20 unpeeled cloves in a small baking dish and drizzle with 2 tablespoons of canola oil. Cover and roast at 375° for 40 minutes, until tender and caramelized. Let cool, then squeeze the garlic from the skins. Jose Garces likes using El Yucateco brand achiote annatto paste. It’s available at elyucateco.com. Grace Parisi blends ingredients into a butter that she rubs all over the turkey. In addition to this one with sage, other creative ideas are Roast Turkey with Lemon and Chives and Roast Turkey with Pickled Jalapeño–Paprika Gravy. Preheat the oven to 350°. Spread the pecans in a pie plate and toast in the oven for about 10 minutes. Transfer the pecans to a food processor and let cool completely. In a medium skillet, heat the oil. Add the garlic and cook over moderate heat until very lightly golden, about 1 minute. Add the sage leaves and fry, stirring gently, until crisp, about 2 minutes. Using a slotted spoon, transfer the sage leaves and garlic clove to a paper towel–lined plate and let cool. Add half of the sage leaves and the garlic clove to the food processor along with the butter and 1 tablespoon of salt; pulse until smooth. Transfer 1/4 cup of the butter to a small bowl and stir in the flour; reserve. Beginning at the neck end, gently separate the turkey skin from the breast and legs using your fingers. Season the turkey cavity with salt. Rub half of the pecan-sage butter from the food processor under the skin, spreading it over the breast and thighs. Set the turkey on a rack in a large roasting pan and scatter the carrot and onion in the pan; add 1 1/2 cups of water. Rub the remaining pecan-sage butter from the food processor all over the outside of the turkey. Roast on the bottom rack of the oven for 3 1/2 to 4 hours, until an instant-read thermometer inserted deep in the thigh registers 170°; halfway through roasting, add 1 1/2 cups of water to the roasting pan and tent the turkey with foil. Transfer the turkey to a carving board and let rest for 30 minutes. Meanwhile, strain the pan juices into a large measuring cup; discard the solids. Spoon off the fat and discard it. (You should have about 2 cups of defatted pan juices.) In a large saucepan, boil the turkey stock until it is reduced to 3 cups, about 15 minutes. Set the roasting pan over 2 burners on high heat; add the reduced stock and scrape up any browned bits stuck to the bottom and side of the pan. Strain the stock into the saucepan, add the pan juices and bring to a simmer. Whisk in the reserved pecan-sage butter with flour and simmer over moderate heat, whisking constantly, until thickened, about 4 minutes. Season with salt. Carve the turkey, transfer to a platter and garnish with the reserved sage leaves. Serve the turkey, passing the gravy at the table. Preheat the broiler and position a rack 8 inches from the heat. Broil the corn, turning, until lightly charred, about 7 minutes. Let cool slightly, then cut the kernels from the cobs. In a food processor, chop the chorizo into 1/2-inch pieces. In a large skillet, cook the chorizo over moderately high heat, stirring occasionally, until the fat is rendered, about 5 minutes. Drain the chorizo and transfer to a paper towel-lined plate; discard the fat. Wipe out the skillet and melt the 4 tablespoons of solid butter in it. Add the onion, celery, garlic, poblanos and thyme and cook over moderate heat, stirring occasionally, until softened, about 10 minutes. Scrape into a large bowl. Add the chorizo, corn kernels, corn bread, melted butter and stock. Season with salt and pepper and stir well. Let cool. Preheat the oven to 450°. Put the anchos in a medium bowl and cover with hot water. Let soak until softened, about 30 minutes. Drain well. In a food processor, puree the anchos with the garlic and butter until smooth. Season with salt and pepper. Rub 2 tablespoons of the ancho paste in the main turkey cavity. 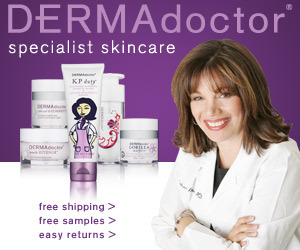 Loosen the skin at the neck and carefully extend your hands all the way to the thigh and leg. Rub the remaining ancho paste under the skin. Loosely fill the main turkey cavity with 5 cups of the stuffing and tie the legs together with kitchen string. Spoon 1 cup of the stuffing into the neck cavity and tuck the extra skin underneath or secure with toothpicks. Spoon the remaining stuffing into a buttered 3-quart baking dish and drizzle with 1 cup of the stock. Set the turkey in a very large roasting pan and season it with salt and pepper. Roast the turkey for 30 minutes, then reduce the heat to 375°. Add 1 cup of the stock to the roasting pan and roast the turkey for 3 hours longer, or until an instant-read thermometer inserted in an inner thigh registers 180° and the stuffing registers 165°. Cover the turkey loosely with foil if the skin browns quickly. 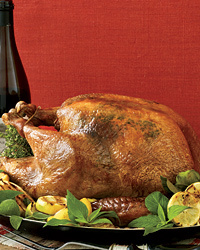 Transfer the turkey to a cutting board, cover with foil and let rest for 30 minutes. 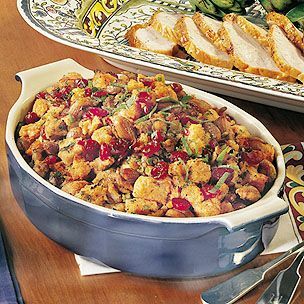 Bake the stuffing in the baking dish for about 30 minutes, or until heated through and crisp on top. Meanwhile, pour the roasting pan juices into a large glass measuring cup. Skim off the fat. In a small cup, whisk 1/2 cup of the stock with the flour and set aside. Set the roasting pan over 2 burners on high heat. Add the remaining 2 1/2 cups of stock and bring to a simmer. Using a wooden spoon, scrape up any browned bits from the bottom and sides of the pan. Add the reserved pan juices to the roasting pan, then strain through a fine sieve into a medium saucepan. Boil the juices over high heat until reduced to 3 cups, about 10 minutes. Whisk in the flour mixture and boil until thickened, about 5 minutes. Season the gravy with salt and pepper and transfer to a warmed gravy boat. Carve the turkey and serve with the gravy and the corn bread stuffing from the turkey and the baking dish. MAKE AHEAD The uncooked corn bread stuffing can be covered with plastic wrap and refrigerated overnight. Stuff the turkey just before roasting. The heat from the chiles and the chorizo calls for an equally spicy and fruity California Syrah. Also known as finocchio, fennel originated in the Mediterranean, where the aromatic bulb vegetable has long been prized for its crisp texture and delicate anise flavor. When selecting fennel, look for smooth, tightly layered bulbs. 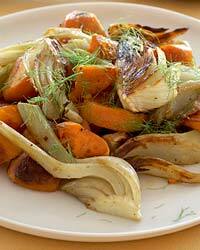 Prepare the fennel by removing the stems and feathery leaves, then cutting the bulb lengthwise. Gently separate the layers and rinse them well. Preheat an oven to 375°F. Butter a 3 1/2- to 4-quart casserole dish. Put the focaccia stuffing in a large bowl. Set aside. In a large sauté pan over medium-high heat, melt the butter. Add the onions, celery and fennel and sauté, stirring occasionally, until soft and translucent, 3 to 5 minutes. Add the wine and cook, stirring to scrape up the browned bits, until most of the liquid has evaporated, about 3 minutes. Add the chestnuts and cook, stirring frequently, for 2 minutes. Season with salt and pepper. Using a slotted spoon, transfer the onion mixture to the bowl with the focaccia stuffing. Return the pan to medium-high heat. Add the sausage and cook, stirring and crumbling with a wooden spoon, until lightly browned and cooked through, about 10 minutes. Using a slotted spoon, transfer to the bowl with the focaccia stuffing. Add the parsley to the bowl and stir to combine. Stir in 3 cups of the stock. The dressing should be moist but not soggy. Add more stock if needed and season with salt and pepper. Transfer the dressing to the prepared casserole dish, cover with a piece of buttered aluminum foil and bake for 20 minutes. Remove the foil and continue baking until the top is golden and crispy, 15 to 20 minutes more. Serves 10 to 12. 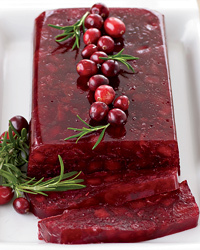 A delicious alternative to traditional cranberry sauce, this mold makes a beautiful presentation at the table. 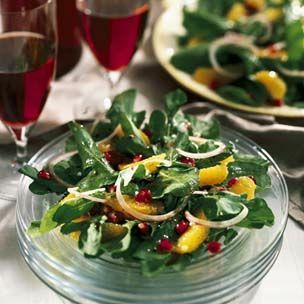 It is a natural partner for the Thanksgiving turkey and also makes a wonderful accompaniment to roasted pork. Lightly coat the inside of a ceramic cranberry mold with nonstick cooking spray. In a large saucepan over medium-high heat, combine the cranberries, sugar, orange zest, orange juice, salt and the 2/3 cup water. Bring to a boil, then reduce the heat to medium-low and simmer, stirring occasionally, until the sauce thickens and the cranberries have burst, about 15 minutes. Meanwhile, pour the 2 Tbs. water into a small bowl and sprinkle with the gelatin. Let stand until the gelatin softens and swells, 5 to 10 minutes. Spoon 1/2 cup of the juices from the cranberries into the gelatin and stir until the gelatin has dissolved. Pour the gelatin mixture into the cranberry mixture and stir to combine. Pour the cranberry mixture into the prepared mold and let cool to room temperature. Cover loosely with plastic wrap and refrigerate for at least 8 hours or up to overnight. To unmold, dip the mold into a large bowl of warm water so the water reaches almost to the rim of the mold. Remove from the water and run a small paring knife or spatula around the inside of the mold to loosen it. Place a serving platter upside down on top of the mold, invert the platter and mold together and shake gently. Then lift off the mold. Serves 12 to 16. 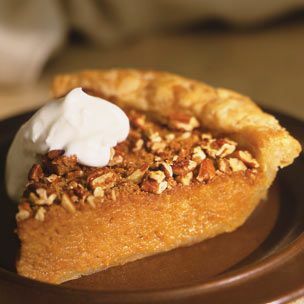 This pie’s filling is a snap to prepare with Muirhead pecan pumpkin butter. Use our precision cutters to top your dessert with beautiful decorations that would make any pastry chef proud. To make the dough, in a food processor, pulse together the flour, granulated sugar and salt until combined, about 5 pulses. Add the butter and process until the mixture resembles coarse meal, about 10 pulses. Add 6 Tbs. of the ice water and pulse 2 or 3 times. The dough should hold together when squeezed with your fingers but should not be sticky. If it is crumbly, add more water 1 tsp. at a time, pulsing twice after each addition. Turn the dough out onto a work surface, divide in half and shape each into a disk. Wrap separately with plastic wrap and refrigerate for at least 2 hours or up to overnight. Position a rack in the lower third of an oven and place a cookie sheet on the rack. Preheat the oven to 400°F (200°C). Let the dough stand at room temperature for 5 minutes. On a lightly floured surface, roll out 1 dough disk into a 12-inch (30-cm) round about 3/16 inch (4.5 mm) thick. Brush off the excess flour. Transfer to a 9-inch (23-cm) deep-dish pie dish and press the dough into the dish. Trim the edges, leaving a 1/2-inch (12-mm) overhang. Fold under the excess dough and, using your thumb, decoratively flute the edges. Using a fork, gently poke holes in several places on the bottom of the crust. Cover with plastic wrap and freeze for 15 minutes. Roll out the other dough disk and make decorative cutouts according to the package instructions for the piecrust cutters. Line the piecrust with parchment paper and fill with pie weights. Place the pie dish on the cookie sheet in the oven and bake for 15 minutes. Carefully remove the parchment and weights and bake until the crust is light golden brown, 5 to 10 minutes more. Transfer to a wire rack and let cool for 15 minutes before filling the pie shell. Reduce the oven temperature to 325°F (165°C). To make the filling, in a large bowl, gently whisk the eggs. Add the pecan pumpkin butter and evaporated milk and whisk until well combined. 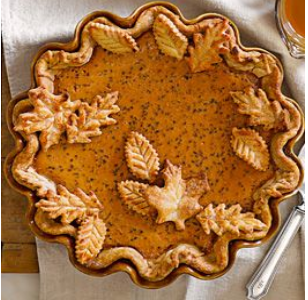 Pour the filling into the pie shell and decorate the pie as desired with decorative cutouts. Bake until the center of the pie is set, 1 1/4 to 1 1/2 hours. If the edges of the crust begin to brown too quickly, cover them with aluminum foil. Transfer the pie to a wire rack and let cool for at least 4 hours before serving. If making in advance, cover the cooled pie with plastic wrap and refrigerate for up to 1 day. Serves 8 to 10. A medley of spices gives a flavor boost to this pie, which makes a festive addition to a winter gathering. To make the dough, in a food processor, pulse together the flour, salt and granulated sugar until combined, about 5 pulses. Add the butter and process until the mixture resembles coarse meal, about 10 pulses. Add 3 Tbs. of the ice water and pulse 2 or 3 times. The dough should hold together when squeezed with your fingers but should not be sticky. If it is crumbly, add more water 1 tsp. at a time, pulsing twice after each addition. Turn the dough out onto a work surface, divide in half and shape each piece into a disk. Wrap the disks separately in plastic wrap and refrigerate for at least 2 hours or up to overnight. On a lightly floured work surface, roll out half of the dough into a 12-inch round about 1/8 inch thick. Fold the dough in half and then into quarters and transfer it to a 9-inch deep-dish pie dish. Unfold and gently press the dough into the bottom and sides of the dish. Trim the edges flush with the rim; reserve the scraps. Refrigerate the pie shell for 30 minutes. On a large sheet of lightly floured parchment paper, roll out the remaining dough disk into a 12-inch round about 1/8 inch thick. Roll out the dough scraps and, using pie cutters, make cutouts for decorating. Refrigerate the dough round and cutouts for 30 minutes. To make the apple-cranberry filling, in a 5 1/2-quart Dutch oven, stir together the apples, brown sugar, 1/4 cup of the granulated sugar, the cinnamon, allspice, cloves, nutmeg, salt and cornstarch until the apples are evenly coated. Set over medium heat, cover and cook, stirring occasionally, until the apples are just tender but not mushy, about 20 minutes. Remove from the heat, stir in the lemon juice and vanilla, and let cool for 30 minutes. Meanwhile, in a saucepan, stir together the cranberries, the remaining 1/2 cup granulated sugar and the water. Set over medium-high heat and cook, stirring occasionally, until the cranberries have broken down slightly and the liquid has thickened to the consistency of a loose jam, 13 to 15 minutes. Let cool for 30 minutes. Add the cranberry mixture to the apple mixture and stir to combine. Let the pie shell, dough round and cutouts stand at room temperature for 5 minutes. Transfer the apple-cranberry filling to the pie shell and gently place the dough round over the pie. Trim the edges flush with the rim of the dish and press the top and bottom crusts together to seal. Brush the underside of the cutouts with the egg wash and gently press them onto the top crust, decorating as desired. Brush the entire top crust with the egg wash and sprinkle with the granulated sugar. Place the pie dish on the preheated baking sheet. Bake until the crust is crisp and golden brown, about 1 hour, covering the edges with aluminum foil if they become too dark. Transfer the pie to a wire rack and let cool for at least 1 1/2 hours before serving. Serves 8.